This saw's predecessor was the best tool of its kind that I'd ever used - until the Husqvarna K 770 Power Cutter superseded it. Lots of power and control at just 22.4 pounds - that's a perfect recipe for its tough job. The new Husqvarna K770 Power Cutter brings a few upgrades to the K760 we reviewed a little while ago. You’ll see some things like a little more weight but with less vibration. The Husqvarna K770 is a premium 14″ power cutter that I can recommend for any masonry cutting up to 5″. The digital ignition is still there and it gets an update to provide a powerful spark with optimized timing, enabling easy start, ­and efficient combustion. I didn’t have an issue starting the K760 – it still starts on the first or second pull. I expect this upgrade will keep that consistent starting longer down the road. The Husqvarna K770 has a spring-loaded system making it easy to ensure that the drive belt always stays at the correct tension. This gives you the best power transmission and reduces wear while improving the life of the belt. The cutting arm has a cast magnesium crankcase with a three-bolt joint to attach the cutting head. That helps give it higher torsional rigidity than the ­previous two-bolt case. It essentially brings down the amount of flex you might have felt from previous saws. A clutch cooling fan lowers the operating temperature inside the belt cover. You get more time between maintenance on the transmission parts and longer service life. As a mason, I use a power cutter for all kinds of cutting projects – concrete block, brick, rebar, foundations, landscape rock, and much more. A 14″ cutter like this one is an excellent all-rounder that you for cuts up to 5″ deep. At first glance, there’s not much difference between the Husqvarna K770 and the K760, particularly since they share the same 4.48 cubic inch engine. However, some of those improvements have a real benefit when you’re using the saw. The entire saw feels incredibly solid through the cutting process. Part of that is the increased strength in the crankcase. More than that, Husqvarna lowered the vibration even more from the K760. When the belt on other saws begins to loosen, you’ll start to feel more vibration and have the belt slip slightly if it’s really bad. 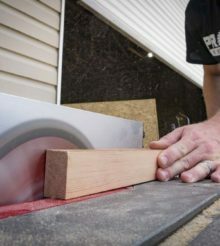 The SmartTension system makes itself known by making the cut incredibly smooth and keeping it that way over time. The K770 is a little heavier than the K760, gaining just under a pound at 22.4 pounds dry weight. However, it’s still easy to handle and has excellent performance for this class. The Husqvarna K770 Power Cutter lists for $1225, but retail prices are closer to $920 as of mid-January, 2019. The K760 doesn’t come cheap but it doesn’t seem overpriced for what you get with this power plant. It’s in the ballpark with Makita’s and Hilti’s 2-stroke models and gives you a little more engine power than either one. It has a comfortable gap before you make it to Makita’s 4-stroke and Stihl is playing at a different price point altogether. The K760 was one of the best 14″ power cutters I’ve used. The Husqvarna K770 Power Cutter bumps up the overall quality and design a bit more and still comes in under $1000.